Here's a peak at my Christmas mantel montage this year: I'm going with a rustic theme in this house. The fireplace kind of calls for that, doncha think? 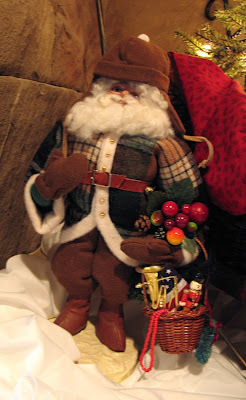 I have to highlight my woodland St. Nicholas for you: He is the creation of the MOST talented artist I know, Darlene Bushmaker, my high school art teacher. She paints wildlife and nature scenes like you wouldn't believe. Actually, she can paint anything and it'll knock your socks off, but in her retirement got into doing these Santa figures. I just adore his plaid jacket and the hat with the ear flaps! I also want to point out I used DaySpring's "Jesus is the Gift" ribbon again to decorate my little tree. This time I used the 3" wide kind. Easy peasy and has a message, too! More IDEA posts coming up!! How perfect! I love it and your sleigh looks so familiar, I think I have one that looks almost exactly the same! Now, that is perfection. The santa, the sleigh, the mantle, the stockings...wow! Simple is good! Very cute! The fireplace doesn't need much since it is so great! Love, love, love it! You have an awesome blog - I'm off to read more. I always love your creative ideas & decor!!! It's gorgeous! I love your fireplace and the rustic display is perfect! 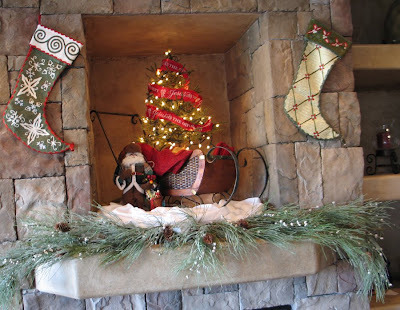 You have a beautiful fireplace and that simple garland is just perfect for it. I don't think it needs anything else! very cute. i love it! Thanks for the commment! I love your blog and your mantel. Merry Christmas! I love your fireplace and what you have done really works well. Love it. Love this rustic look! So cute! Oh, yay. I love Christmas, and I LOVE your ideas! ; ) Your mantle is beautiful. I totally agree- rustic and simple is the way to go with that mantel. It's a LOVELY garland! I LOVE the rustic look. I think it is perfect with your beautiful fireplace!